Grow a healthy and waste-free garden while helping your community. 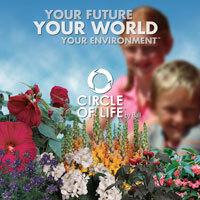 The Circle of Life® program offers an eco-friendly way to garden with biodegradable pots and beautiful, high-performing plants produced by local growers. The plants are produced by a grower in your area, so you can count on the best performance for your climate – plus, local deliveries save on fuel!